Touchdown dances and end zone celebrations are so passé, not to mention likely to draw a penalty flag. Now it’s all about the sideline props. From Miami’s turnover chain to Tulane’s beads to Tennessee’s trash can, college football teams are constantly coming up with new, and odd, ways to celebrate takeaways. The Boise State Broncos, who host UConn Saturday night (10:15, ESPNU), are the new kings of this category, literally. No. 22 Boise State has deemed its defense the “Kings of Chaos” this season, and coach Bryan Harsin’s Broncos unveiled a “Turnover Throne” on its sidelines in its Week 1 game at Troy in Alabama. Any defender producing a turnover earned the right to sit in the big chair. With the prop adding some motivation, the Broncos produced four turnovers in their 56-20 road win over Troy, the 2017 Sun Belt champion. Harsin was asked about the impetus for the addition to his bench. “The first rule of the throne is we don’t talk about the throne,” Harsin said with a laugh. Much like the other schools who have taken this rout, Boise State is trying to add some joy to its efforts. “Those are fun things. That’s to have fun. It’s just a symbol of what we try to create,” Harsin said. Boise cornerback Tyler Horton was clearly the king last week, returning two fumbles for touchdowns to tie an NCAA record. And yes, he got a chance to play the game of thrones. “We can have fun as long as we prepare the right way. We can enjoy moments like that and have fun during the game,” Harsin said. One week after being dissected by Central Florida quarterback McKenzie Milton, the Huskies have another talented quarterback to deal with this weekend. 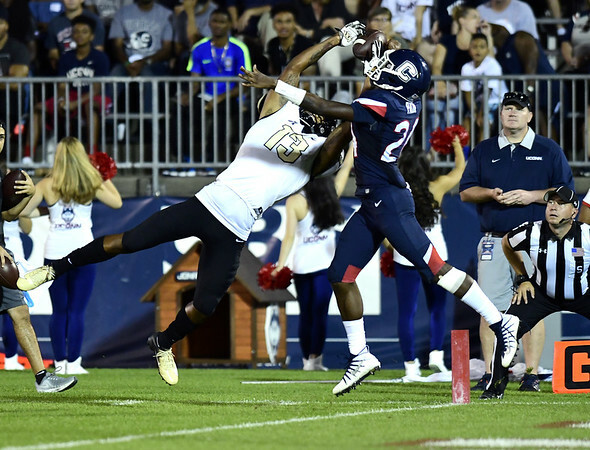 “McKenzie Milton was outstanding,” UConn coach Randy Edsall said. This week UConn must battle Boise State senior Brett Rypien. Rypien, the nephew of former NFL quarterback Mark Rypien, was 20-of-28 for 305 yards and 4 touchdowns in his team’s opening victory. Now in his fourth year as a starter, Rypien has already thrown for 10,181 yards and 64 touchdowns in his career. So which QB is a tougher matchup, Milton or Rypien? “They’re both very talented and they know exactly what they’re doing in the scheme they’re playing,” Edsall said. Saturday will be the second meeting between the Huskies and Broncos. They met Sept. 13, 2014 in East Hartford as Boise pulled away for a 38-21 victory. “I think it’s a good matchup. I think it’s a fun game,” Harsin said. … Boise State is 24-1 in non-conference home games since the start of the 2006 season. … UConn has lost 10 of its last 11 road games. … Houston nose tackle Ed Oliver was named the American’s defensive player of the week after recording 13 tackles, 3.5 for a loss, in the Cougars’ 42-27 win over Rice. 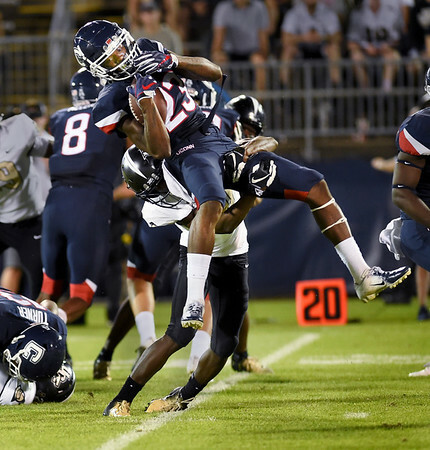 Central Florida safety Aaron Robinson, who was involved in a scary collision on the opening kickoff of Thursday’s game, returned to Orlando on Saturday after a short stay at the UConn Health Center. Robinson wrote on Twitter that UConn coach Randy Edsall had visited him earlier. “Wanted to thank everyone who reached out specifically UConn head coach Randy Edsall, his wife and their medical staff for coming to visit me in bed much appreciated!” Robinson wrote. A Connecticut Superior Court judge is set to hear arguments about whether UConn football coach Randy Edsall should be allowed to retain his son as an assistant coach with the team. Edsall is appealing a ruling by the state’s ethics office that the school violated Connecticut’s ban on nepotism by hiring Corey Edsall in 2017 as the school’s tight ends coach. That ruling led a lawmaker to include paragraph on an unrelated piece of legislation this year to allow immediate family members to work in the same “constituent unit” of the state system for higher education with certain conditions. Both sides are scheduled to present oral arguments on Wednesday before Judge Joseph Shortall in New Britain Superior Court on a motion to dismiss the case. Posted in New Britain Herald, UConn on Tuesday, 4 September 2018 21:14. Updated: Tuesday, 4 September 2018 21:29.